An Apple Valley apartment developer has a letter of intent to buy from the city a four-acre site near the new outlet mall under construction in Eagan. 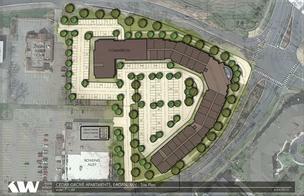 Stonebridge Cos. wants to build a 180-unit “higher end” apartment complex at the site. Stonebridge will present its preliminary plans to the Eagan Economic Development Authority at a meeting Tuesday, said Stonebridge President Wally Johnson. Stonebridge was one of several residential developers approached by the city to gauge interest in the site, which is located on the east end of the Cedar Grove Redevelopment District. A new 409,000-square-foot outlet mall by Paragon Outlet Partners broke ground near there on Tuesday. Johnson said he pursued the site because there’s not a lot of new residential housing in the area, the site has excellent visibility, and the mall will create “a huge infusion of people and traffic.” The addition of a rapid transit bus terminal at the site is also a plus, he said. The four- to five-story apartment project would be complimented by between 10,000 and 14,000 square feet of retail space as well. The Eagan staff has recommended that the city council give its approval for the sale, and allow the staff to begin negotiating a purchase agreement with Stonebridge. Johnson said he’s hoping to begin construction this fall.